AUCTION featuring Two Great Approved Developments Ready for Construction - Offered As a Whole Totaling 53 Lots! in Murfreesboro, Tennessee by Comas Montgomery Realty & Auction Co., Inc.
BID ONLINE or ON LOCATION Tuesday, February 19th, 2019 @ 1:00 PM. AUCTION HELD ON SITE at 805 Osborne Lane, Murfreesboro, TN. Real Estate Terms: On Location Terms: 5% Buyers Premium added to the final bid price to determine final selling price. 10% down day of sale and balance due at closing. Property information believed to be accurate but not guaranteed. Must close within 45 days after the auction date. Announcements made day of sale take precedence over any previous advertising. Online Terms: 1. Bidding Increments: Each Comas Montgomery Realty & Auction Company Inc. auction may have different bidding increments. The software will calculate the next bid amount before submitting the bid. 2. Agency: Comas Montgomery Realty & Auction Co., Inc., Agents and Representatives are agents of the Seller. 3. Buyer's Premium: There will be a five percent (5%) Buyer’s Premium added to final bid price to determine the final selling price. 4. Auction Ending: The auctioneer will have sole discretion when to close the bidding for this auction. 5. Time Increase or Decrease: Comas Montgomery Realty & Auction Co., Inc. may increase or decrease the amount of time to place a bid for this auction. 6. Outbid Notification: Bidders will need to watch their bidding screen to determine the current winning bid amount. Absentee bids may receive an email notice if outbid, but not guaranteed. 7. Property Information & Inspection: Comas Montgomery Realty & Auction Co., Inc. is not responsible for any missing or incorrect listing information. Comas Montgomery Realty & Auction Co., Inc. has attempted to provide accurate descriptions. However, it is the bidder's responsibility to conduct any inspections to determine the condition and feasibility of the bidder’s intended use. Descriptions that are provided by Comas Montgomery Realty & Auction Co., Inc. are provided in good faith and are matters of opinion. 8. Auctioneer's Discretion: Comas Montgomery Realty & Auction Co., Inc. has full discretion to modify the date, time, order, and details of the auction for any reason or no reason at all, including but not limited to technical issues, emergencies, and convenience of Comas Montgomery Realty & Auction Co., Inc. or the seller. 9. Server & Software Technical Issues: In the event that there are technical difficulties related to the server, software or any other online auction-related technologies, Comas Montgomery Realty & Auction Co., Inc. reserves the right to extend bidding, continue the bidding, or close the bidding. Neither the company providing the software nor Comas Montgomery Realty & Auction Co., Inc. shall be held responsible for a missed bid or the failure of the software to function properly for any reason. Email notifications may be sent to registered bidders with updated information as deemed necessary by Comas Montgomery Realty & Auction Co., Inc. THE ONLY GUARANTEE THAT YOUR BID WILL BE PLACED IS TO BE AT THE ACTUAL LIVE BIDDING EVENT! 10. Terms: ONLINE BUYER: 10% OF THE FINAL BID PRICE REQUIRED as non-refundable earnest money in the form of a certified check, cash or wire transfer within 24 hour of the close of auction (or next business day), with the balance of purchase price due at closing. Purchaser shall be responsible for all wire transfer fees. ON SITE BUYER: 10% OF THE FINAL BID PRICE REQUIRED as non-refundable earnest money IMMEDIATELY AFTER THE CLOSE OF THE AUCTION, with the balance of purchase price due at closing. Closing will be as specified in the Contract for Sale of Real Estate. This online only auction is a CASH SALE not contingent on or subject to financing, appraisal, survey or inspections of any kind, as agreed to by Bidder and or Buyers at registration prior to bidding and specified in the Contract for Sale of Real Estate under “files” sections of the webpage. 11. Contract for Sale of Real Estate: ONLINE BUYERS: The contract is required to be fully and correctly completed, WITHOUT any modifications and properly signed within 24 hours of the close of auction. ON SITE BUYERS: The contract is required to be executed immediately after the close of the auction. 12. Closing: Property is to be closed within 45 days after the auction unless otherwise stated in the purchase and sale contract. NO EXTENTIONS. Be prepared to close. 13. Closing Costs: Seller is paying the owner’s title insurance policy premium and its attorneys’ fees. Otherwise, all other costs are paid by Buyer including financing costs, inspection costs, title endorsements, loan title insurance, transfer taxes and recording costs. 14. Property Condition: Buyer specifically acknowledges herein that the property is being purchased "AS IS" with all faults and that neither the Seller nor Comas Montgomery Realty & Auction Company, Inc., makes any warranties or representations, express or implied, as to the habitability, condition, square footage, acreage or boundary lines of the real property conveyed herein. Seller is NOT responsible for any repairs. 15. Hold Harmless: Buyer and or Bidder agrees to hold harmless and indemnify the Seller, Comas Montgomery Realty & Auction Co., Inc. and its Agents, Owners, Directors, Employees and its Representatives from any and all claims, damages or suits including but not limited to awards, judgments, costs, fees, etc. 16. Disputes: Any dispute between Comas Montgomery Realty & Auction Co., Inc., its Agents or Representatives and the Buyer(s) will be tried in a court of jurisdiction in Rutherford County, Tennessee. By bidding on any item, buyer agrees to all terms and conditions set forth. EACH PARTY HEREBY KNOWINGLY, VOLUNTARILY AND INTENTIONALLY WAIVES (TO THE EXTENT PERMITTED BY APPLICABLE LAW) ANY RIGHT IT MAY HAVE TO A TRIAL BY JURY OF ANY DISPUTE ARISING UNDER OR RELATING TO THIS AGREEMENT AND AGREES THAT ANY SUCH DISPUTE SHALL BE TRIED BEFORE A JUDGE SITTING WITHOUT A JURY. 17. Auction Bidder and/or Buyer Default: Successful Bidder and or Buyer not executing and returning the contract with earnest money deposit AS SPECIFIED IN PARAGRAPH 10 AND 11 will be considered in default. In the event a winning Bidder and or Buyer fails to submit the signed Contract for Sale of Real Estate and earnest money deposit, the winning Bidder and or Buyer shall pay to Comas Montgomery Realty & Auction Company, Inc., as damages, an amount equal to the Buyer's premium or commission percentage, as set forth in said Contract, and any and all expenses incurred by the said Comas Montgomery Realty & Auction Company, Inc., for said auction. Should Buyer's earnest money check be returned for any reason whatsoever, this shall constitute an item of default, and in addition to the remedies previously stated hereinabove, Buyer shall also pay an additional penalty of five percent (5%) of the earnest money check to Comas Montgomery Realty & Auction Company, Inc. Buyer shall also pay a reasonable attorney's fee and costs incurred in the collection of these monies owed by Buyer as a result of Buyer's default. Buyer shall also pay the Seller any damages caused by said breach of contract, including attorney's fees and costs. This shall not preclude the Seller from suing for specific performance of the Contract of Sale, in addition to said damages. It is specifically understood and agreed by and between the Seller and Comas Montgomery Realty & Auction Company, Inc., that in the event the Buyer should default in the terms of this Contract in any manner whatsoever, that the earnest money, or sufficient sums therefore, shall be paid first to the agent for the Buyer's premium or commission percentage, and the balance, if any, to the Seller. Any disputes will be tried in a court of jurisdiction in Rutherford County, Tennessee. Comas Montgomery Realty & Auction Co., Inc. reserves the right to sell to the next highest qualified Bidder and or Buyer in the event the successful high Bidder and or Buyer does not comply with the terms of the sale. By bidding on the property, buyer agrees to all terms and conditions set forth. The contract is required to be fully and correctly completed, without any modifications and properly signed. A contract that is incomplete, incorrect, or modified in any respect, by the Bidder or Buyer, is considered to be in default. 18. Auction Cancellation – Bid Rejection: Comas Montgomery Realty & Auction Co., Inc. reserves the right to reject any and all bids for any reason. Comas Montgomery Realty & Auction Co., Inc. reserves the right to cancel this auction, or remove any item or lot from this auction prior to the close of bidding even if a bid has been placed. 19. Acceptance of Bid Prices: ALL BIDS ARE SUBJECT TO SELLER CONFIRMATION UNLESS NOTED AS ABSOLUTE. Successful Bidder and or Buyer(s) will be required to enter into a purchase agreement immediately following the close of the auction. 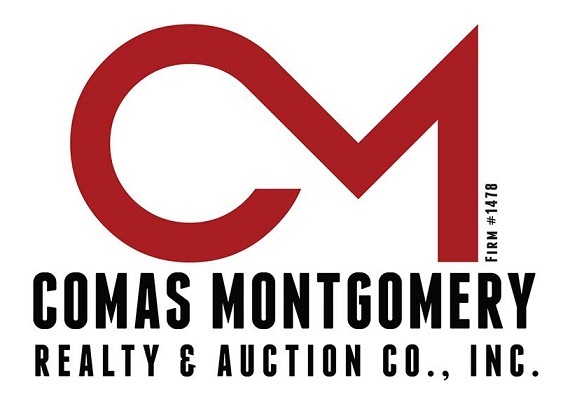 Comas Montgomery Realty & Auction Co., Inc. will e-mail documents to be executed and fax or e-mail back to Comas Montgomery Realty & Auction Co., Inc. within 24 hours of the end of the auction. Successful Bidder and or Buyers not executing and returning contracts with earnest money deposit within 24 hours will be considered in default. Any and all inspections that a buyer may want must be completed at buyer’s expense prior to the close of the online bidding. Comas Montgomery Realty & Auction Co., Inc., Agents, Representatives or Employees may bid. Comas Montgomery Realty & Auction Co., Inc. reserves the right to sell to the next highest qualified Bidder and or Buyer if the winning Bidder and or Buyer is in default of these terms. Winning Bidder and or Buyer must execute the contract with no changes, modification, additions or deletion. 20. Title: As specified in the Contract for Sale of Real Estate 21. Deed: As specified in the Contract for Sale of Real Estate 22. Possession: As specified in the Contract for Sale of Real Estate 23. Real Estate Taxes and Closing Cost: UNLESS OTHERWISE STATED IN THE CONTRACT FOR SALE OF REAL ESTATE, all taxes will be prorated to day of closing using the most current available year’s tax amount. HOA fees and condominium assessments, if any, will be prorated up to the date of closing. The purchaser will pay all other closing costs associated with the purchaser’s side of the sale, including local and state recording fees and any cost associated with the purchaser’s loan. 24. Easements/Restrictions: Subject to any and all easements and restrictions of record. 25. Zoning: This property is subject to all state and local zoning ordinances. 26. Acreage & Aerial Photos: Parcel dimensions and acreages are based on legal descriptions. Aerial photos are for illustration purposes only and not surveyed boundary lines. 27. Bidder Verification: The identity of all bidders will be verified. Bidding rights are provisional, and if complete verification is not possible, Comas Montgomery Realty & Auction Co., Inc. will reject the registration, and bidding activity will be terminated. The Seller and Comas Montgomery Realty & Auction Co., Inc. reserve the right to preclude any person from bidding. Comas Montgomery Realty & Auction Co., Inc. reserves the right to modify, change, or remove usernames at any time. 28. Bidder Responsibilities: Bidder responsibilities include, but are not limited to: Bidders agree to keep their username and password confidential, as they are responsible for ANY and ALL activity involving their account. If the registered bidder's user name is offensive to Comas Montgomery Realty and Auction Co., or in their sole opinion detrimental to Bidding Activity, then Comas Montgomery Realty and Auction Co., reserves the right to delete the bidder from bidding or unilaterally change the username with notification to the Bidder. When using the web site you must obey any and all local state and federal laws. Violations will result in termination of web site use privileges. Auction company employees and/or auction company may bid on auction. We gather aggregate information from the web site which may include but is not limited to: number of page visitors, most visited pages, and any and all correspondence. Comas Montgomery Realty & Auction Co., Inc. reserves the right to modify, change, or remove usernames at any time. 29. Guaranty Agreement: By submitting a bid in the name of a business entity or corporation, the individual submitting the bid enters into a guaranty agreement whereby he or she personally guarantees earnest money payment to Comas Montgomery Realty & Auction Co., Inc. 30. Age Requirement: All bidders must be eighteen (18) years of age or older. 31. Bidding Priority: The auction company reserves the right to make live floor bidding a priority over all online bidding at anytime during the auction.